A warming period more than 400,000 years ago pushed the Greenland ice sheet past its stability threshold (which may have been no more than several degrees above pre-industrial temperatures). This resulted in a nearly complete deglaciation of southern Greenland, raising global sea levels some 4.5-6 meters, found a recent study by Reyes et al. 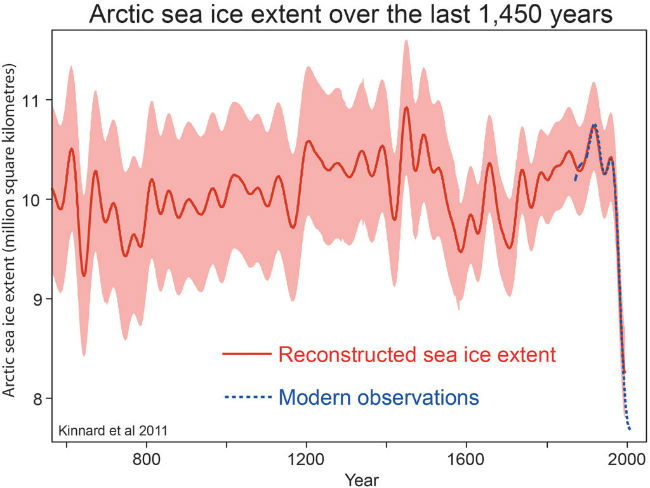 Due to melting elsewhere, global mean sea level then was 6 to 13 metres above the present level. Indeed, melting of the entire West Antarctic Ice Sheet can add a further 6-meter rise in sea levels. If the East Antarctic Ice Sheet (EAIS) were to melt as well, sea levels would rise by around 70 metres. 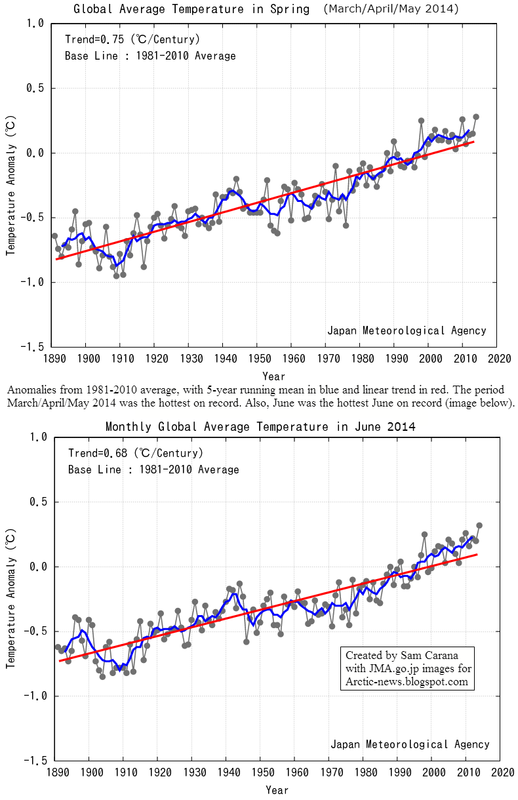 Sea level is now rising by 3.1mm (0.122 inch) per year. 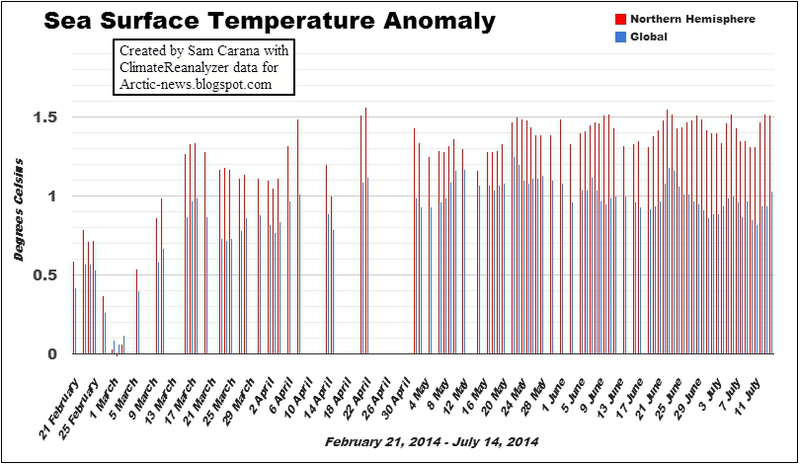 Much of this rise is due to rising temperatures, but there are also other factors. One quarter of the rise results from groundwater depletion, while run off from melting ice and glaciers adds another quarter and the remainder is attributed to thermal expansion of sea water. Furthermore, as temperatures rise, feedbacks start to kick in, e.g. the kinetic energy from stronger waves and more intense storms can speed things up. Clearly, a rapid multi-meter rise would be devastating as it would flood many coastal cities, as well as much of the land now used to grow food. By how much have sea levels been rising recently and how fast can they be expected to rise in the near future? NASA image, data by the JPL PODAAC, in support of the NASA's MEaSUREs program. 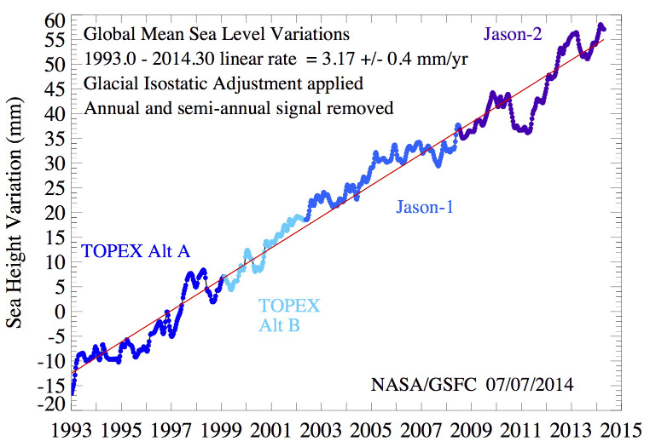 Sea levels have risen by some 60 mm over the past 20 years, as above NASA image shows, which has a linear trendline added. The question is whether a linear trendline is the most appropriate trendline, given that it suggests that a similar rise could be expected over the next 20 years. A polynomial trendline appears to fit the data better, as the animation below shows. 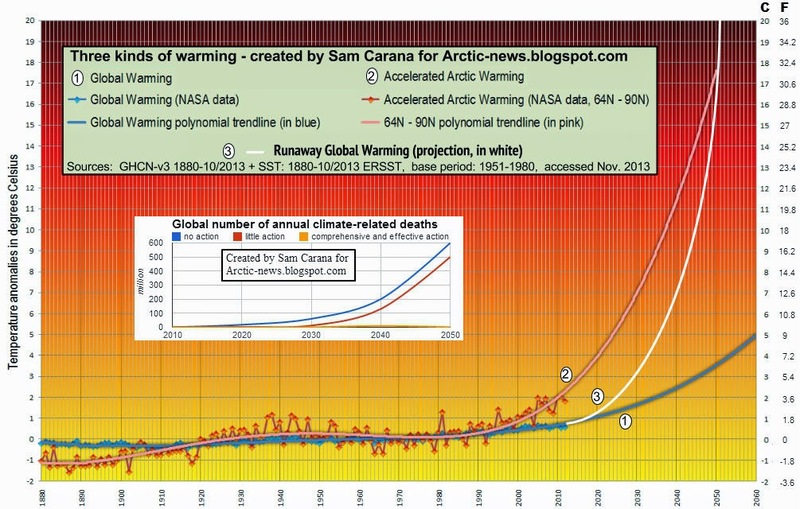 Such a polynomial trendline, however, points at a similar rise (of some 50 mm) in just four years time, with an even more steeper rise to follow, as illustrated by the image below. And indeed, such a rise doesn't slow down there. 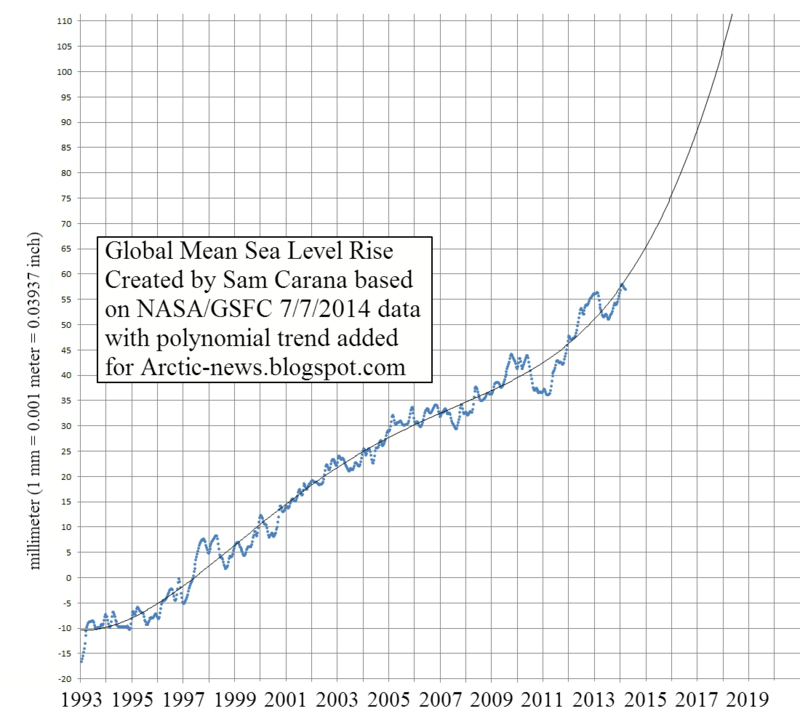 A polynomial trendline applied to the data points at a sea level rise of more than 2.5 m (8.2 ft) by the year 2040. 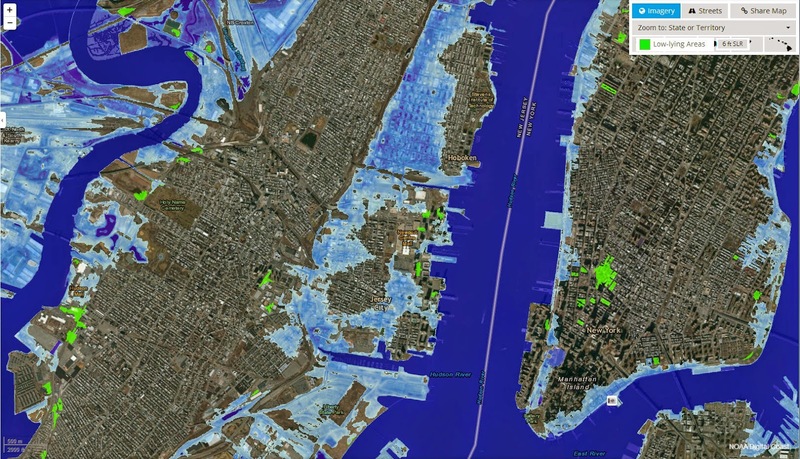 The image below gives an idea of what a sea level rise of six feet (1.829 m) would do to the City of New York. 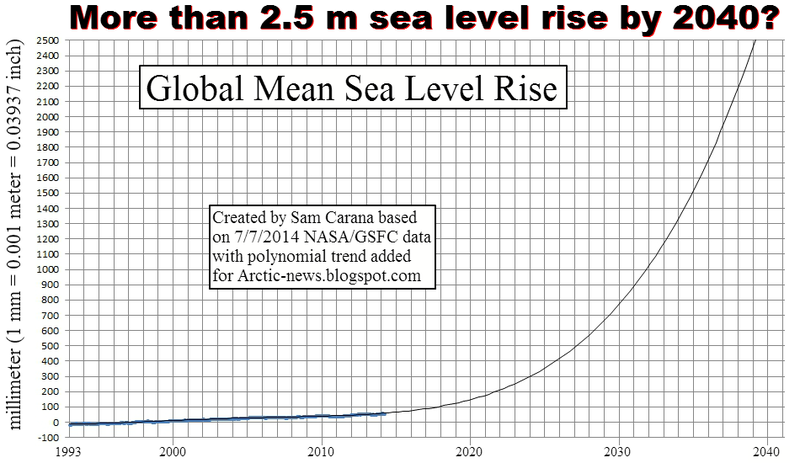 Of course, this is only the sea level rise. Storm surge would come on top of this, as discussed at Ten Dangers of Global Warming. So, what would be more appropriate, to expect sea levels to continue to rise in a linear way, or to take into account feedbacks that could speed things up? Where such feedbacks could lead to is illustrated by the image below. 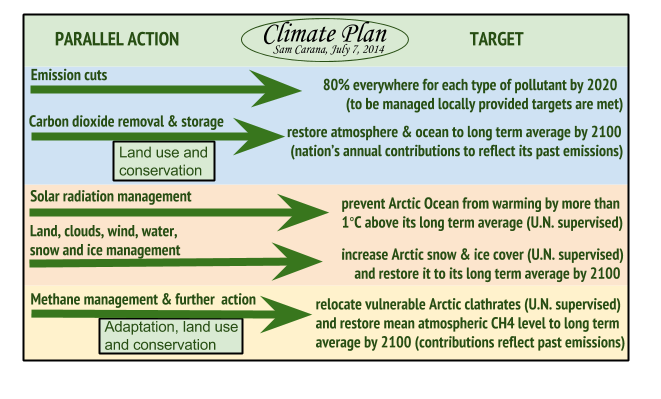 This calls for comprehensive and effective action, as discussed at the Climate Plan blog. Methane is colorless and odorless and it is right above us in the atmosphere. 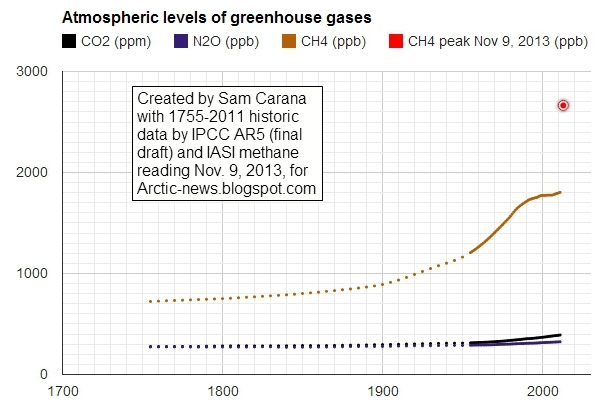 In addition to other sources, methane has traveled from the Arctic and has blanketed most of the Northern Hemisphere. 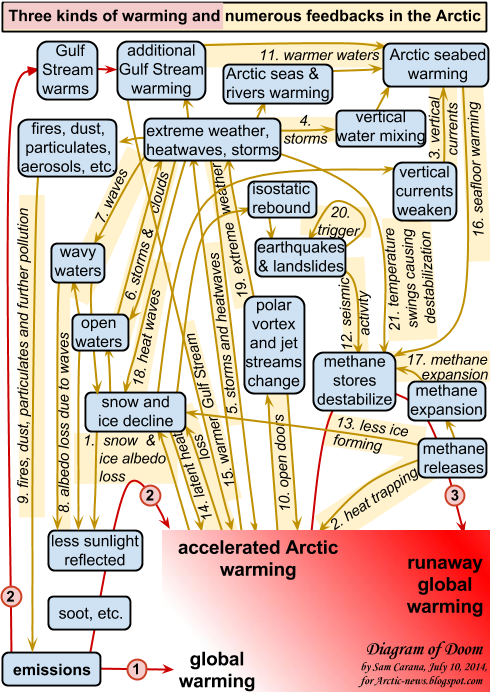 The well-known sources are methane hydrates from the Arctic Ocean floor and methane coming from thawing permafrost. There is also another less well-known source. During the geologic history of the Arctic area, tectonic plates have spread, crashed into each other and subducted under one another. Geologists call the Arctic a tectonic plate junkyard. 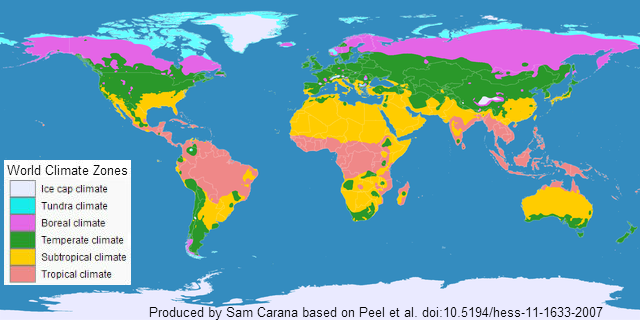 There are numerous fractures in the earth's crust there. 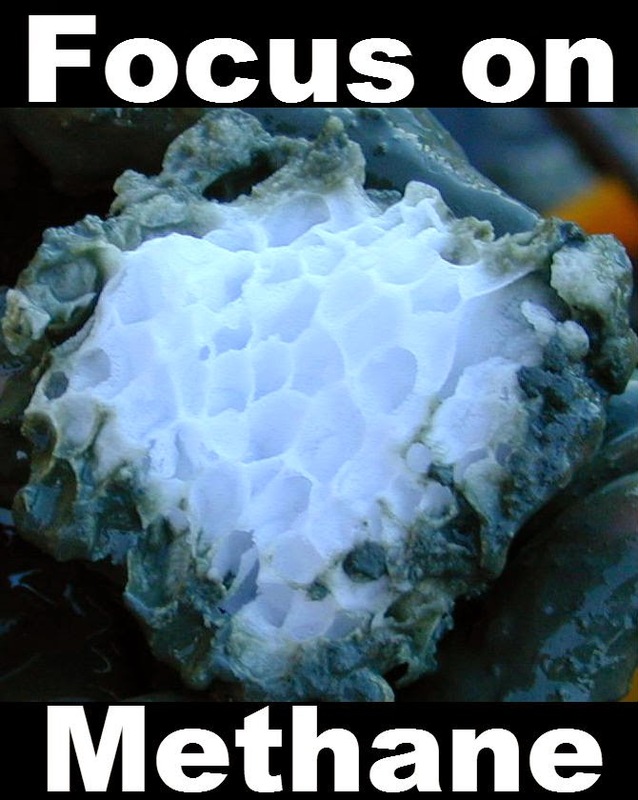 A quote from earth scientist Malcolm Light: ‘Mantle methane formed from the reduction of oceanic carbonates by water in the presence of iron (II) oxides buried to depths of 100 km to 300 km in the Asthenosphere and at temperatures above 1200°C.’ This is a nonorganic source of methane formed near the earth's mantel. Katey Walter Anthony from the University of Alaska calls it geologic methane. Vast reservoirs of methane have been created by chemical reactions and stored near the mantle under a lot of pressure for millennia. The methane has had a route to the surface through the fractures in the earth's crust, but the fractures have been sealed over by ice. Now for the first time in human history, the ice sealing the fractures is thawing. 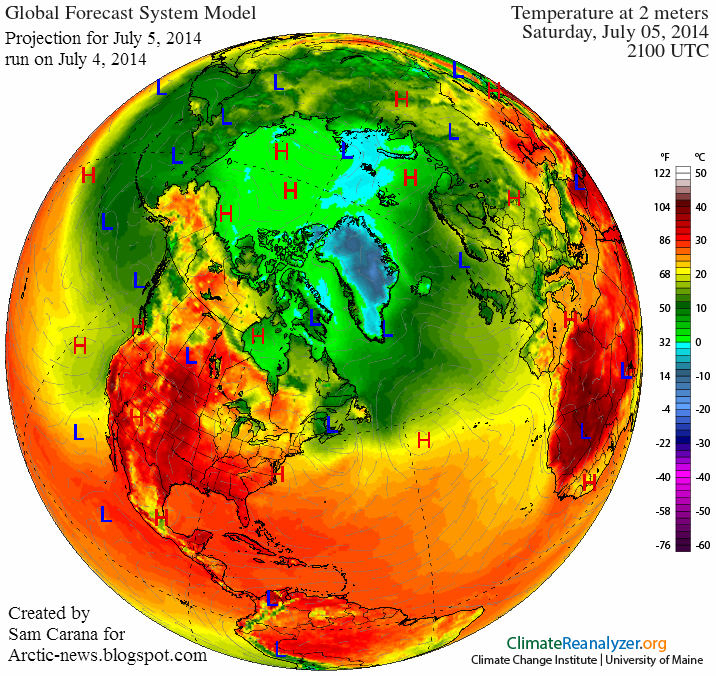 Methane is rising through the fractures and into the atmo­sphere. This methane has migrated to the United States and is over us. Methane formed by organisms in the water becomes trapped in the fabric of water ice crystals when it freezes and is stable below about 300 metres depth in the Arctic Ocean. There are such massive methane reserves below the Arctic Ocean floor that they represent around 100 times the amount that is required to cause a Permian style major extinction event, should the methane be released into the atmosphere. There are also giant reservoirs of mantle methane, originally sealed in by shallow methane hydrate plugs in fractures cutting the Arctic seafloor. 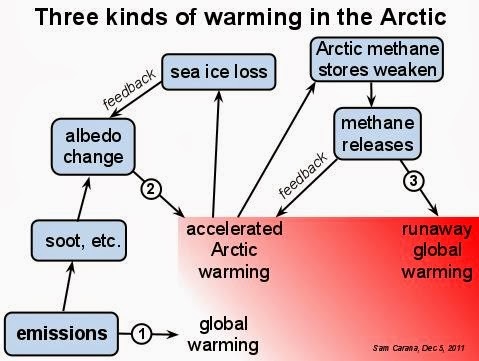 Unfortunately for us, global warming has heated up the oceanic currents fed by the Gulf Stream flowing into the Arctic, causing massive destabilization of the subsea methane hydrates and fault seals and releasing increasing volumes of methane directly into the atmosphere. The volume transport of the Gulf Stream has increased by three times since the 1940s due to the rising atmospheric pressure difference set up between the polluted, greenhouse gas rich air above North America and the marine Atlantic air. 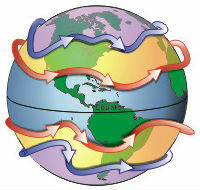 The increasingly heated Gulf Stream, with its associated high winds and energy rich weather systems, flows NE to Europe where it recently pummelled Great Britain with catastrophic storms. Other branches of the Gulf Stream then enter the Arctic and heat up the Arctic methane hydrate seals on subsea and deep high - pressure mantle methane reservoirs below the Eurasian Basin- Laptev Sea transition. This is releasing increasing amounts of methane into the atmosphere contributing to anomalous temperatures, greater than 20 degree C above average. 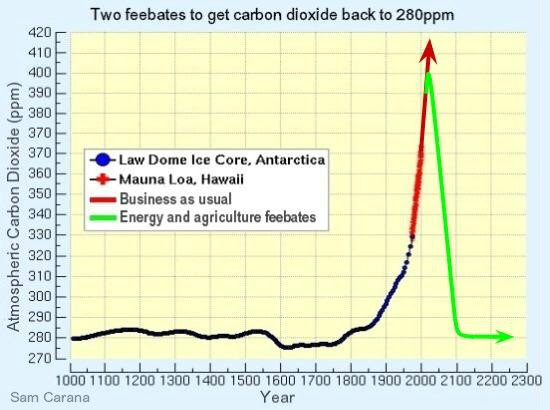 Over very short time periods of a few days to a few months the atmospheric methane has a warming potential from 1000 to 100 times that of carbon dioxide. on the Qinghai-Tibetan Plateau and on Greenland. such an amount to be ready for release at any time. From: Will the Anthropocene last for only 100 years? There are such massive reserves of methane in the subsea Arctic methane hydrates, that if only a few percent of them are released, they will lead to a jump in the average temperature of the Earth's atmosphere of 10 degrees C and produce a "Permian" style major extinction event which will kill us all. The whole northern hemisphere is now covered by a thickening atmospheric methane veil that is spreading southwards at about 1 km a day and it already totally envelopes the United States. 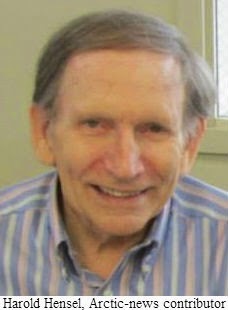 A giant hole in the equatorial ozone layer has also been discovered in the west Pacific, which acts like an elevator transferring methane from lower altitudes to the stratosphere, where it already forms a dense equatorial global warming stratospheric band that is spreading into the Polar regions. 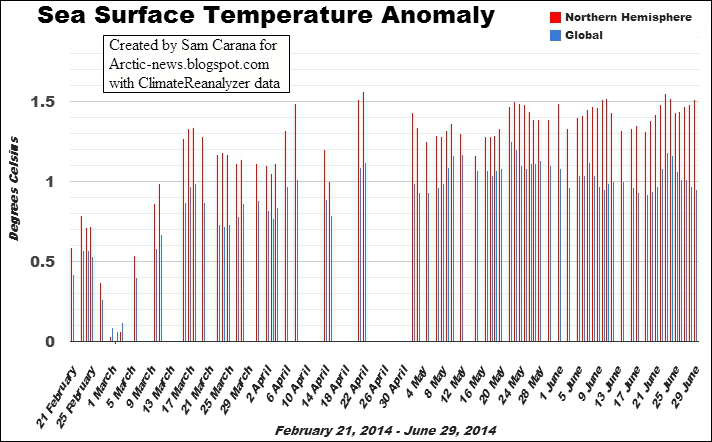 The spreading atmospheric methane global warming veil is raising the temperature of the lower atmosphere many times faster than carbon dioxide does, causing the extreme summer temperatures in Australia and the US. During the last winter, the high Arctic winter temperatures and pressures displaced the normal freezing Arctic air south into Canada and the United States, producing never before seen, freezing winter storms and massive power failures. When the Arctic ice cap finally melts towards the end of next year, the Arctic sea will be aggressively heated by the sun and the Gulf Stream. The cold Arctic air will then be confined to the Greenland Ice cap and the hot Arctic air with its methane will flow south to the United States to further heat up the Gulf Stream, setting up an anticlockwise circulation around Greenland. Under these circumstances Great Britain and Europe must expect even more catastrophic storm systems, hurricane force winds and massive flooding after the end of next year, due to a further acceleration in the energy transport of the Gulf Stream. 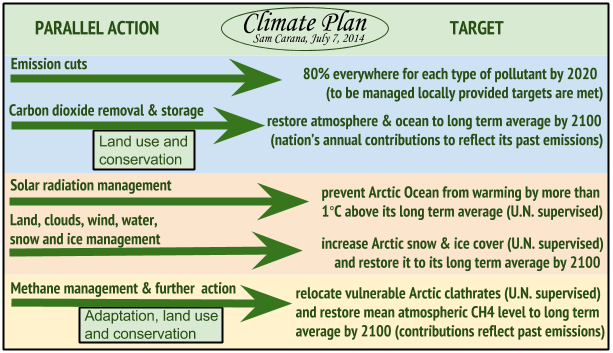 If this process continues unchecked the mean temperature of the atmosphere will rise a further 8 degrees centigrade and we will be facing global deglaciation, a more than 200 feet rise in sea level rise and a major terminal extinction event by the 2050s. 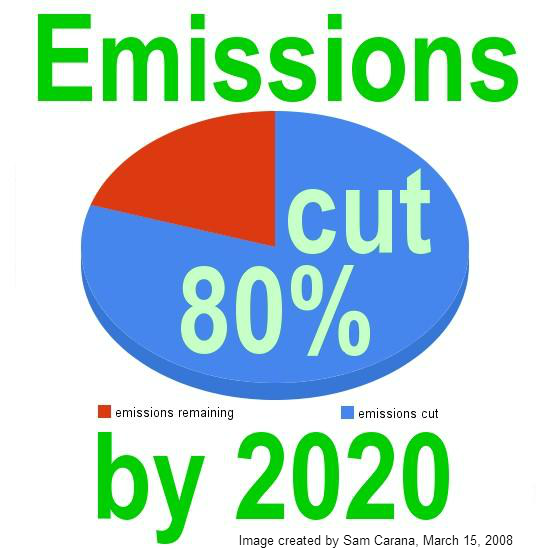 The US and Canada must cut their global emissions of carbon dioxide by 90% in the next 10 to 15 years, otherwise they will be become an instrument of mass destruction of the Earth and its entire human population. Recovery of the United States economy from the financial crisis has been very unsoundly based by the present administration on an extremely hazardous "all of the above" energy policy that has allowed continent wide gas fracking, coal and oil sand mining and the return of widespread drilling to the Gulf Coast. 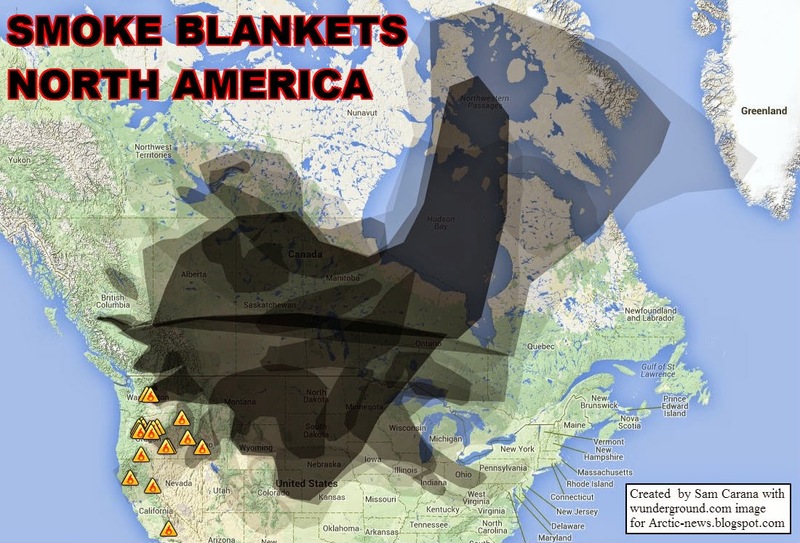 This large amount of fossil fuel has to be transported and sold which has caused extensive spills, explosions and confrontations with US citizens over fracking and the Keystone XL pipeline. Gas fracking is in the process of destroying the entire aquifer systems of the United States and causing widespread earthquakes. The oil spills are doing the same to the surface river run off. We are now facing a devastating final show down with Mother Nature, which is being massively accelerated by the filthy extraction of fossil fuels by US and Canada by gas fracking, coal and tar sand mining and continent wide bitumen transport. The United States and other developed nations made a fatal mistake by refusing to sign the original Kyoto protocols. The United States and Canada must now cease all their fossil fuel extraction and go entirely onto renewable energy in the next 10 to 15 years otherwise they will be guilty of planetary ecocide - genocide by the 2050's. 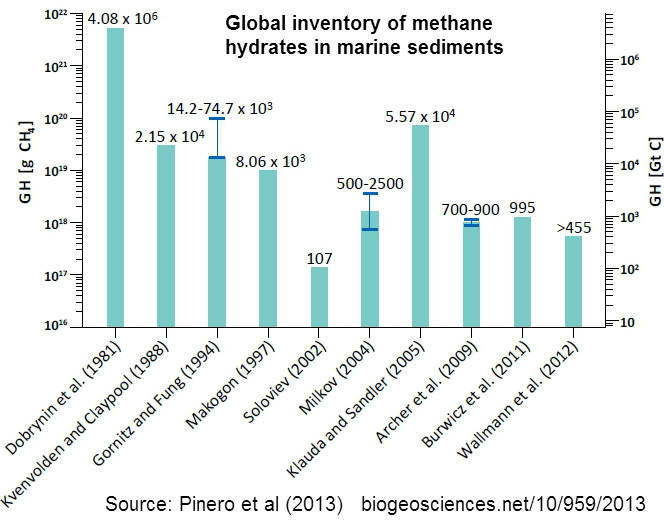 There must also be a world-wide effort to capture methane in the oceans and eradicate the quantities accumulating in the atmosphere. 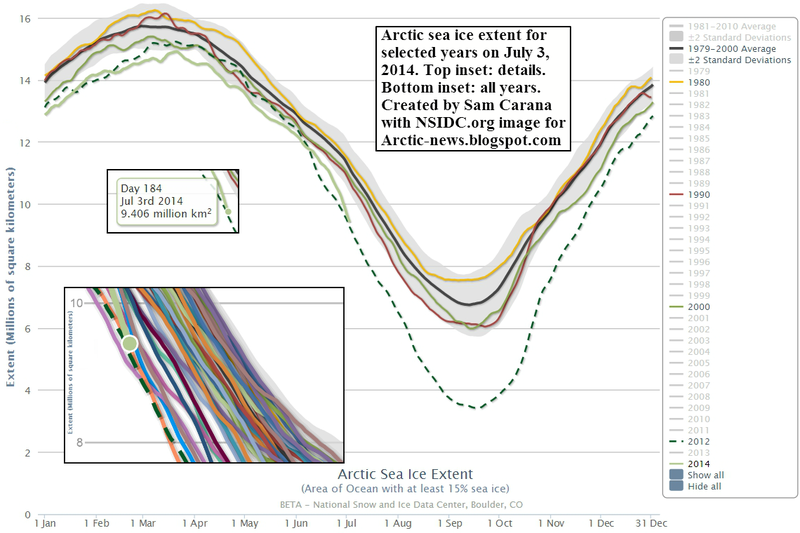 Arctic sea ice extent is close to a record low for the time of the year, as the image below shows. 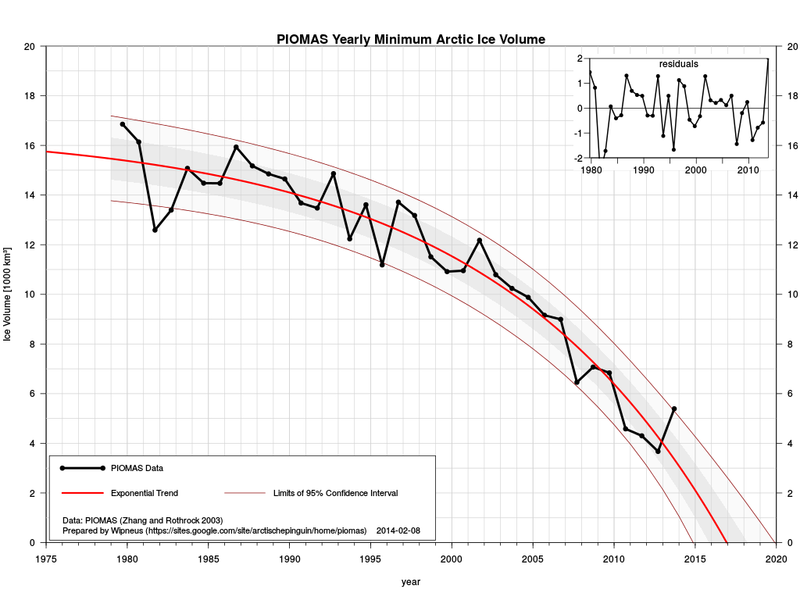 Furthermore, the current decline in sea ice extent is much steeper than it used to be for this time of the year, raising the specter of sea ice hitting an absolute record low later this year. 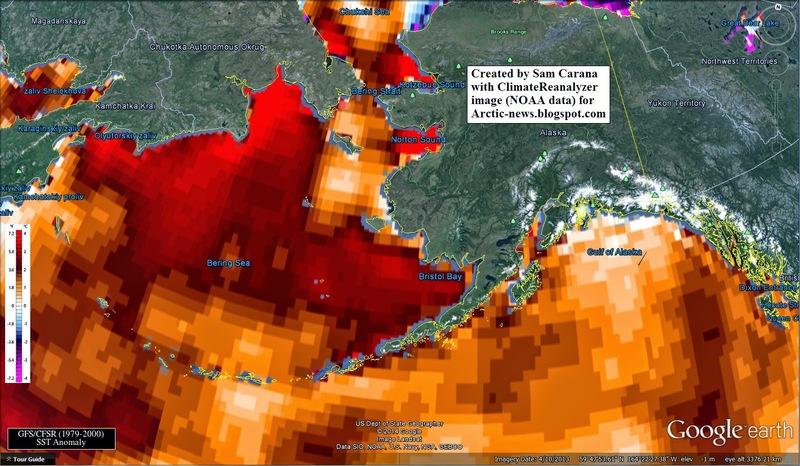 Moreover, a total collapse of sea ice may occur if storms continue to develop that push the remaining ice out of the Arctic Ocean into the Atlantic Ocean. The threat posed by storms is illustrated by the track projected to be followed by Hurricane Arthur (above NOAA image, July 4), renamed as Post-Tropical Cyclone Arthur (NOAA image below, July 5). The path followed by Arthur is influenced by the current shape of the jet stream. 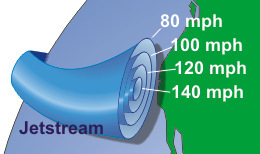 As the animation below illustrates, the jet stream looks set to prevent Hurrican Arthur from moving to the east and instead make it move into the Labrador Sea to the west of Greenland and - partly due to the high mountains on Greenland - continue to wreak havoc in Baffin Bay further north. As described in an earlier post, post-tropical cyclone Leslie made landfall with hurricane-force winds in Newfoundland in September 2012. The large extratropical low pressure system continued to move rapidly northeastward across eastern Newfoundland at a forward speed of near 45 kt, and merged with a much larger extratropical low over the Labrador Sea. Recent research by NOAA-affiliated scientists suggests that - over the years - the latitude where hurricanes, typhoons, and cyclones reach their maximum intensity on the Northern Hemisphere has shifted closer to the North Pole. 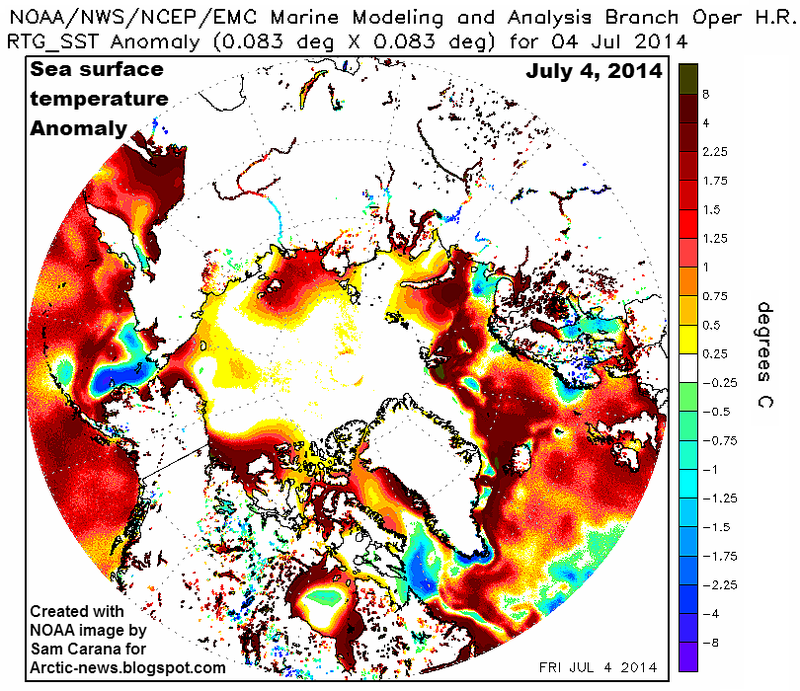 Such storms can bring lots of heat and moisture into the Arctic, and they can also increase the height of waves. 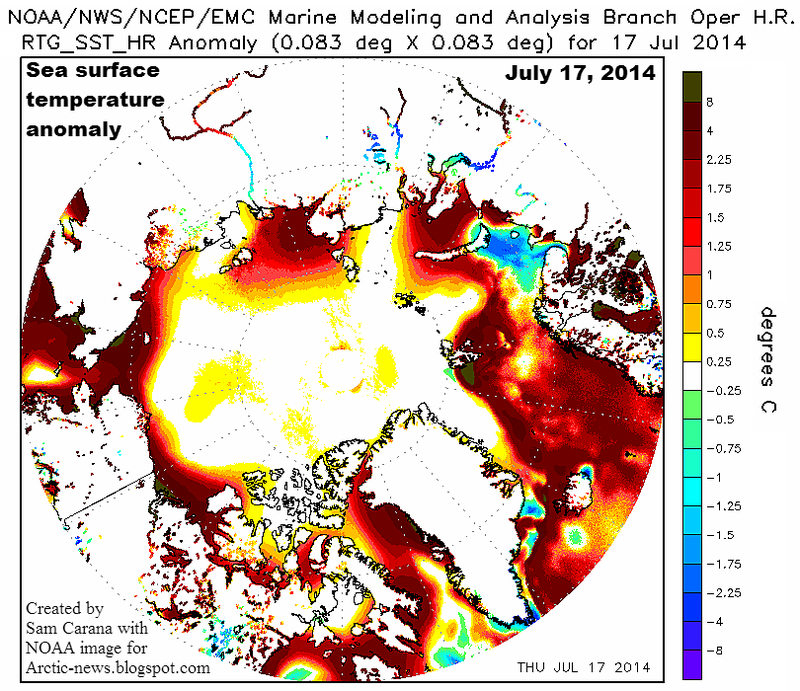 All this can have devastating impact on the sea ice. The many ways in which storms can increase the dangerous situation in the Arctic is described in the post Feedbacks in the Arctic. 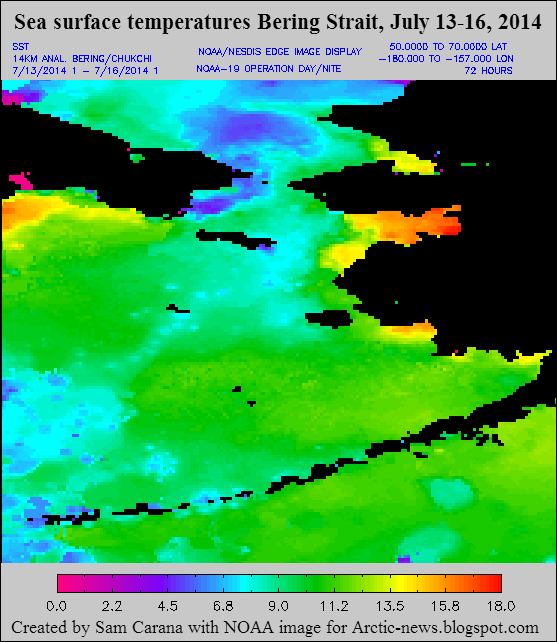 Additionally, the sea ice is currently very thin, as shown by the Naval Research Laboratory animation below.